Now we have the meeting of the two ripples under normal, optimum conditions. 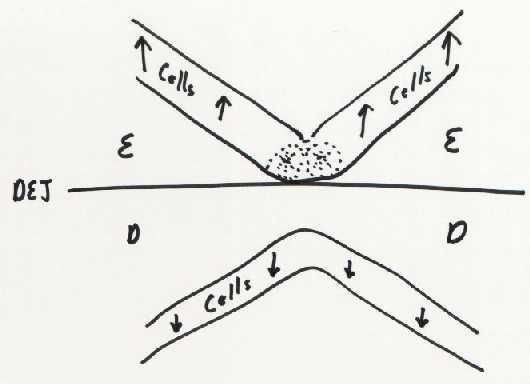 On the bottom, the dentin sparks have met and all the cells are turned on and moving down and away from the DEJ. On the top, the enamel sparks got just close enough before the dentin sparks left, so the enamel sparks also got all their cells turned on, and now they will all be going to the surface together. This will make a layer of enamel with no fissure.